FNUPress ReleasesLatest NewsLADY CONQUISTADORS SWEPT AWAY BY THE SEAHAWKS IN AN EXCITING GAME AT BUCKY DENT. LADY CONQUISTADORS SWEPT AWAY BY THE SEAHAWKS IN AN EXCITING GAME AT BUCKY DENT. HIALEAH, FL. 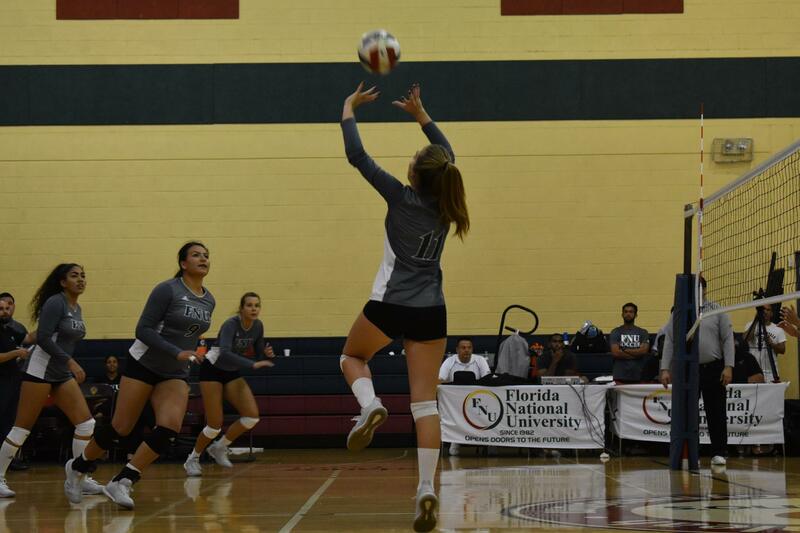 – The Florida National University women’s volleyball program is 8-7 to start the season. Lady Conquistadors lost tonight in a closely fought game against Keiser Seahawks. 1st set | The Seahawks ran away with the first set 25-22 in a battle to take the first set, Seahawks took the advantage from the beginning but lady conquistadors couldn’t catch them up. 2nd set | Seahawks outscored Lady Conquistadors 25-21. The defense couldn’t handle the high numbers of kills from the away team. 3rd set | Lady Conquistadors showed more resistance in the third set which their performance got much better and took the set away. The Seahawks defense suffered Camilla Kahlich and Ines Bawedin killer attacks. 25-18 for Lady Conquistadors. 4th set | It was a real battle between Lady Conquistadors and Seahawks. We defeated the Seahawks with hard work and struggling until the end to take the set away. 25-23 for our team. 5th set | In a very exciting final set the Seahawks managed to defeat our lady conquistadors 20-18, both teams fought until the end of a very tight set. ON THE HORIZON: Lady Conquistadors will take on Webber International University at 7:00 PM on Friday 09/21 on Babson Park, FL.